Yea’s Rob O’Halloran underwent a complete form reversal this week to become the Men’s Eildon ‘Mini Master‘. 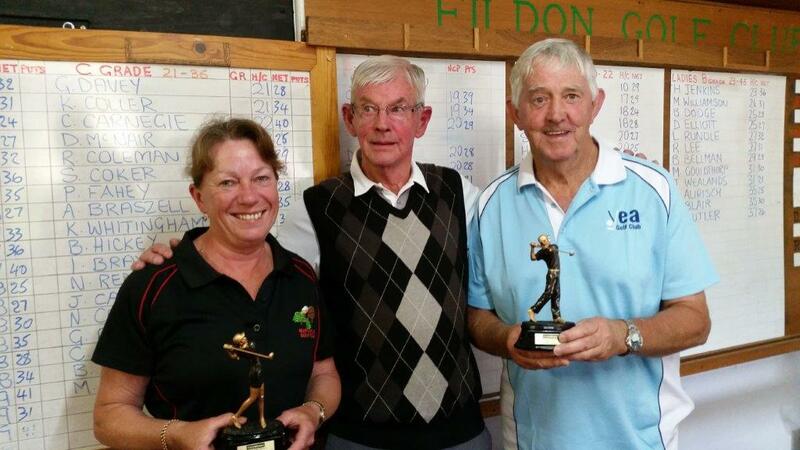 Saturday was the 2nd Round of the Murrindindi Masters played on the tight Eildon Golf Course. It seems like there is nothing quite like winning the Club’s often hated ‘Club Award’ for having the worst score to spur one to greatness! Or maybe it was finally putting into practice what he had learnt from his lesson with Golf Professional, Michael Waghorn???? Having carded a shocker of -10 in last Wednesday’s Gender Challenge (Par), Rob showed everyone that it was just a ‘blip’ by carding a magnificent 41 Pts to claim the prestigious Mini Masters on a countback. Winners are Grinners, hey Bob. Doc Martin was invited to perform the called for swab ….. but sadly it was his day off!! Marj Gouldthorpe was the best performed Yea Lady carding very creditable 30 pts. Yea had 23 players representing the Club – well done everyone, and our thanks to the entire Reddrop family for sponsoring this great event. 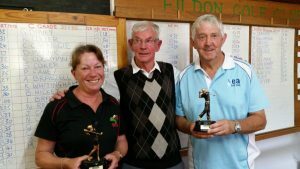 Sue Aurisch blitzes the field ……yet again! !